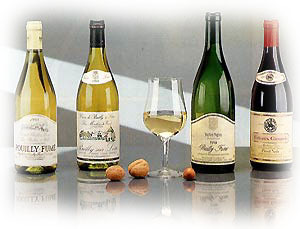 Welcome at the "Caves de Pouilly sur Loire"
At "Caves de Pouilly sur Loire" we bring together the best qualified wine-growers who seek to ensure the purity of their supply. Fresh crops of grapes are delivered to our cellars and put into the hands of a technician who will supervise each stage of the wine-making process right up to the bottling. Our concern belongs entirely to wine-growers who manage our compagny, and owing to this high professional qualification our wine can be offered the world over. The "simple pleasure" of eating good meat becomes a "delight". bring the best out of accompaning dishes, and help digestion. They enleven the atmosphere of your dinner-parties in a friendly and joyful way. So you guest will have been exquisitely entertained.